Azul supports the awakening of consciousness and recognizes that, as we transform ourselves we create the conditions for our world to transform. Azul harnesses the body’s intelligence to facilitate inner healing and evolution and utilizes movement combined with a psycho-spiritual approach as a vehicle for exploration. Awakening happens by going in and through our humanity and releasing the blocks that hold us back from experiencing our true essence. The dharma of the sun is to bring warmth, the dharma of the water is to quench the thirst, the dharma of the human being is to love. Azul takes us through a journey of awakening consciousness working with the intelligence of the body. The body contains all information needed in order to complete our healing journey and access our full power. Awakening happens by going in and through our humanity and releasing the blocks that hold us back from experiencing our true essence. That is why embodiment is so potent: because it helps us purify and integrate all of our life experiences. Love is our true essence: it is living effortlessly in the flow of life, fully expressing our gifts and talents, experiencing joy, health and prosperity. The image of Azul is an upward spiral where we work with embodiment to awaken our hearts. This opens a space for healing, where we can transform our suffering into self-knowledge and awaken the Self with ever deepening awareness, until we come to fully experience ourselves as love. Love is our true essence: it is living effortlessly in the flow of life, fully expressing our gifts and talents, experiencing joy, health and prosperity. Azul supports evolution by providing a map that guides us through the various stages of growth and delivers us to experience life in its fullest expression. This path can lead you as far as you wish to take it. The Workshops are designed to explore individual topics that provide a foundation for personal transformation. They serve as introduction to the deeper exploration of the retreats. They are open to all and no previous experience is required. The Retreats are designed to take another step in the work of self discovery. They are held in residential settings which provides a container for a deeper inquiry into an aspect of the path of Azul. The Trilogy is a three-part program that provides a container for deep personal healing and transformation. It is designed to support you in aligning with your deepest potential. Each of the three modules offers an immersion experience in a 6-day retreat. The Azul Teacher Training is an experiential program designed to prepare individuals to become channels of this work into the world. It is articulated in two 10 day retreats offered over a 12 month period. The Azul Online Offerings provide you the opportunity to be on the path of Azul at home. These 50 minute guided movement sessions explore aspects of the Azul Spiral. A new offering is released every other month on the first Tuesday. There is an archive of all Azul Online Offerings available when you join the mailing list. 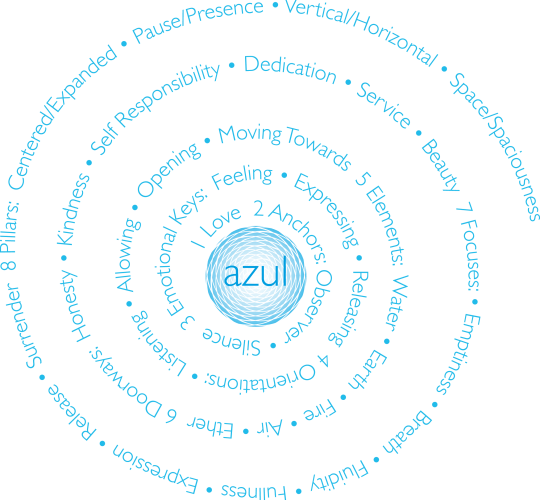 On the path of Azul we are committed to the six values of Honesty, Kindness, Self-Responsibility, Service, Dedication and Beauty. From the core of the Azul organization, Amara and Paolo and the Azul Team that coordinates the programs, through the movement practice and the teacher trainings, these values are the foundation upon which Azul is built. As we incorporate these values into our lives through continued practice, great healing, growth and transformation result. Azul is open to all people interested in personal and collective evolution. It is also a useful tool for movement teachers who wish to expand their horizons , for therapists who wish to incorporate movement in their practice, for community and business leaders who desire to create more harmonious and collaborative social and work environments. Ultimately, the path of Azul is an open invitation for all those who wish to engage in a journey of self-realization.